I absolutely adore magazines! Flipping through the pages is such a relaxing time for me, and I can do this with a limited amount of time. However, I do not like paying for magazines. So I have found a way to help the environment and enjoy my magazines! The local recycling company in town partners with RecycleBank, and you earn points every time you recycle. You can “cash in” your points in the reward store, and I typically use mine on magazines! I try to subscribe to a variety to keep my mind fresh and to broaden my perspectives. Recently my subscriptions have included Food Network, Real Simple, Dwell, Money and Time. When I am done reading, I either pass the magazine onto a friend or they go into my recycling bin. I have estimated this has saved me around $150 in the past 6 months! Now I can do something I enjoy, while saving money! Another option is to try your library as they often have copies of recent magazines and you can request back issues. « Amazon.com: Hamilton Beach 8-Quart Slow Cooker for just $21.24! 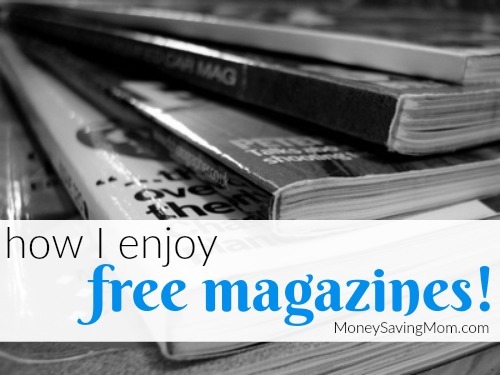 I get all my magazines FREE through recycle bank, coke rewards, mercury magazines, freebizmags and I think there might be one or 2 more places. Then I pass them on to my Mom and Dad !! Thanks for the tip on the other ones besides recycle bank, I will have to check those out. I love that you pass them on to your family!